The place was in complete chaos. Many were getting trampled and shoved to the ground. Several got into a physical fight, while others were just yelling at each other. No, this wasn’t in a mosh pit at a wild death metal concert — this was a scene from my local Walmart (NYSE: WMT), and it was my first taste of the complete madness that is Black Friday. That was several years ago, when the doorbuster sales all started simultaneously at the stroke of midnight at many major retailers. Since then, the doorbuster deals have crept into Thanksgiving Day, as many retailers have chosen to open at various times throughout Thursday. I think this staggering effect has reduced some of the dizzying chaos that goes along with Black Friday, but it hasn’t slowed shoppers who would rather grab the latest deals than spend a few more hours of quality time chatting and having seconds or thirds with family. And the quick boost it gives to the retailers is immediately transparent in their stock prices. 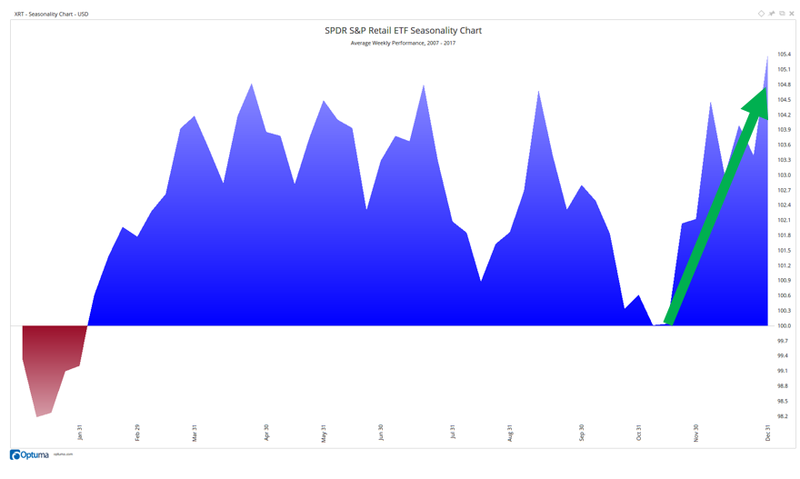 The chart depicts the seasonality of retail stocks throughout the year. The green arrow highlights the strong surge higher retail stocks have experienced from about Black Friday through the end of the year. This is the strongest rally for the sector of the year. Though this seasonal trend only lasts about a month, you can still grab some sizable gains by trading either the SPDR S&P Retail ETF (NYSE: XRT), or, if you prefer, specific retail stocks that have great Black Friday deals. These would include Wal-Mart, Best Buy Co. (NYSE: BBY), Amazon.com Inc. (Nasdaq: AMZN) and Target Corp. (NYSE: TGT).